The 10th July celebrates ‘National Don’t Step On A Bee Day’ – but what does that mean for our buzzing friends? Did you know that bees are an essential part of our eco-system and because of that are worth over £650 million per year to the UK economy? Unfortunately, in recent years the number of bees in some countries has nearly halved because of changes to their habitat and a toxic cocktail of pesticides and fungicides. 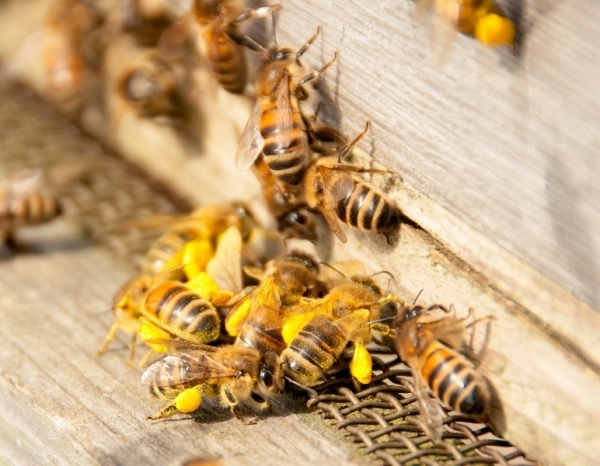 The introduction of a deadly mite called Varroa, which was accidentally imported from Asia, has also affected the number of honeybees in the English countryside as well. 1) Avoid chemically treating your flowers as the chemicals will transfer onto the pollen and affect the bees. This is because if any chemicals are applied to your flowers while they are in bloom it will get into the pollen and nectar, the bees will then take it back to the beehive and it will transfer into the honey. 2) A lawn full of daisys and dandelions is a great haven for bees and a natural food source, so avoid putting any treatments on your grass and instead embrace its natural beauty. The honey bees will thank you for it! 3) Did you know bees like to drink water? If you want to encourage more honey bees leaving a little water basin out, or making sure your bird bath is topped up with water and stones for them to crawl on, is helpful for both the birds and the bees in your garden! 4) Always try and buy British honey at farm shops and delis. The majority of honey we find on the shelves in UK supermarkets is imported from abroad when we have so many local beekeepers across the country. 5) Why not experiment with seed balls to help nurture some bee-friendly blooms? Try scattering seed balls made with wild flower seeds, clay, compost and chilli powder in your garden to create a colourful array of flowers that will attract bees from far and wide. Cornflowers, sunflowers and wildflowers like poppies are always popular with buzzing bees. 6) Adopting a beehive is a fantastic way to support The British Bee Keepers Association and to help encourage vital research into honey bee health. It’ll also make the perfect gift for nature lovers and gardeners everywhere! 7) For anyone who has always toyed with turning their fascination with honey bees into a hobby, owning a beehive can be a really rewarding experience. If that seems too much work, installing a bee house into your garden will give any friendly bees a place to hibernate during the winter as well.